Update - 7/29/2015 - Corrections to Integrated Disclosure Rule continue! The CFPB's newest "final" rule amended the TILA-RESPA Integrated Disclosure (TRID) Rule. Changed the timing requirement for the issuance of a revised Loan Estimate resulting from a rate lock event to align with the timing requirement for all other changed circumstances - the third business day after the triggering event (the rate lock). 2.) Added the LE and CB to the list of documents requiring Loan Originator names and NMLSR IDs. While you have some time before you HAVE to be ready, the deadlines are quickly approaching. 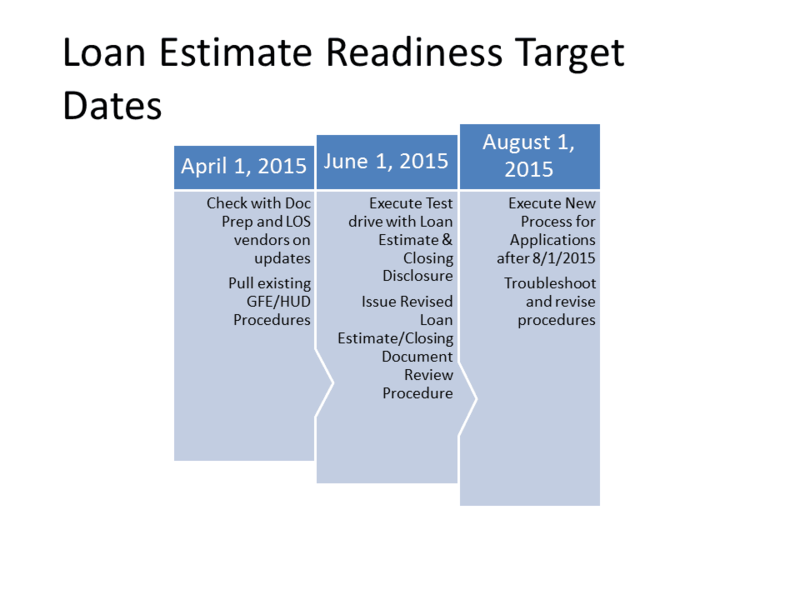 While many industry compliance experts toll the warning bells loudly and repeatedly that the sky is falling, the reality emerges that the new loan estimate process represents a refinement of the 2010 GFE process and the elimination of the TIL. Regulators should receive some credit for the difficult task they have accomplished involving combining two completely different laws into one unified customer facing document. Here we take the time to step backward and look at the real changes, and see where our actual policies and procedures will have to change to ensure and prove compliance. First, from a conceptual framework, the process itself hasn't changed. The industry has and continues to provide RESPA and TIL disclosures, and the procedure for resolving changes and errors remain the same. The difference is that, because of the unified form, instead of having two separate paths (TIL and RESPA) we now have one. The benefits of a single track outweigh potential complications from misunderstanding. Examining GFE 2010 and TIL/MDIA, and then identifying the components required from each, provides a framework for implementation. Six Items ONLY – cannot refuse to issue based on "Additional Info Needed"
Much of the concern and perception of upheaval comes from the complete reinvention of two of the forms we see most often; the GFE and TIL. We have less to worry about in regards to completing the new loan estimate and closing disclosure because the burden of integrating these falls on our Loan Origination Systems (LOS) and Doc Prep vendors. Ellie Mae is one vendor who has proactively addressed the Integrated Disclosures and has already completed its input screen and benchmark re-builds. Examining their courses with respect to the updates, you can see only a few fields got added to account for the changes and record-keeping purposes. If your LOS or Doc Prep vendor has not provided you a roadmap for these elements, note that the compliance deadline nears. You should allow yourself 60 days to update your procedures and alert your staff to several new definitions, as well as conducting some dry runs to ensure you can execute on August 1, 2015. Working backwards, this means that your LOS and Doc Prep vendors should have information to you at least 60 days in advance of this. That means your vendors should have your products updated by April 1, 2015. Adopting this new regulatory scheme, unless your business focuses on reverse or home equity lending, means that the old TIL disclosure procedures take a distant back seat. To amend your existing procedures, you will overwrite your GFE application process. If you do not have a procedure for GFE or Closing Docs Review to edit, we can provide this as part of our Lender or Correspondent Packages - or contact us for a stand-alone process document which we will issue in February. One of the large changes I am seeing in this new process is the loan officers ability to gather information (ie...bank statements, purchase contract, paystubs, etc.) from the client prior to the Loan Estimate being provided. For mortgage companies with a centralized disclosure desk this would pose an issue if you are taking a face to face interview of your client and in order for the loan officer to be compliant with these new rules they would need to wait for the Loan Estimate to be done before collecting any of the documents from the client. Am I correct in my understanding of 1026.19(e)(2)(iii)? Great comment. Turn this reading around: the loan officer CANNOT hold back the estimate as a result of not having information (as under GFE 2010 rules) beyond the 6 elements. The combination of TIL and RESPA means that a discussion of a specific loan amount will drive the generation of a Loan Estimate. The writers INTENDED to require early disclosure. This shouldn't change current process too much as the intent to proceed process and expiration of the Loan Estimate still exists. The downside is that the estimate may precede an ACTUAL application pursuant to the lender's credit policy, so the magnitude scope of the potential change of circumstance situation vastly increases. Instead of waiting until he or she has everything needed to issue an ACCURATE estimate, the estimate will change when the borrower provides additional information.